If you think that a comprehensive cosmetic laser system needs to be bulky and expensive, then you need to reconsider that view and check out the Lumenis M22 laser machine. This compact system weighs less than 90 pounds and features a modular system that can be expanded as your needs change. SunrayLaser.com has new and used Lumenis M22 laser machines for sale at the lowest price you will find. The Lumenis M22 laser system combines an Nd:YAG laser with IPL technology to create one of the most versatile cosmetic machines available today. 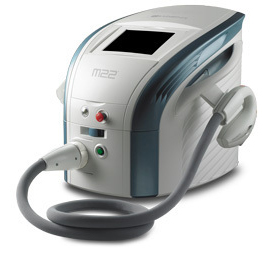 Despite its small size, the M22 system can produce big results in a short amount of time. It is easy to move between offices and features well over 100 pre-set treatment protocols for even greater efficiency. There are several different configurations and modular options for the Lumenis M22 laser machine, and SunrayLaser.com is ready to deliver the best system to meet your needs at the best possible price. Contact us right now for a no obligation quote on a pre-owned Lumenis M22 laser system. Every used cosmetic system we sell at SunrayLaser.com comes with a 100% satisfaction guarantee. We are able to offer that because we only sell quality pre-owned systems that have been professionally inspected and tested to make sure they meet our high standards. Contact us today for more information or for a free Lumenis M22 laser machine price quote.